British Sea Power are quite famous, so I won't spend too much time talking about them. They played here in Minneapolis yesterday (March 21st) at the Triple Rock Social Club. They certainly "like the rock music" and their set ended with a wacky destructo free-for-all rock out encore. 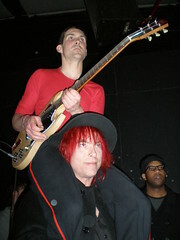 There were great moment during the show, including guitarist Martin Noble climbing and playing on the shoulders of an audience member and later just climbing on various people. The guy's pretty tall too, so it's quite funny to see. The bassist (Hamilton) and guitarist (Yan) both switch back and forth to sing. I'm having a hard time remember who was playing what, but I believe the bassist's singing style wasn't really meant as rock and rolly as I get the impression his lyrics are more sensitive. It's really too bad because everything was really noisy and you could barely hear what he was saying. Perhaps it's the Triple Rock sound system, perhaps I'm going deaf in my old age. While I'm complaining - why bother with Abi Fry, the violin player, as it sounds to me that all the notes she played ended up being drowned by two guitars, a bass, drums and a brass cornet (yes, it's true). There was a shining moment when no one was playing and all you could hear was Fry's violin being played. The other two opening band was Minneapolis' One for the Team (myspace.com), who I was told was recently signed to The Miltia Group. A few other bands in the group's camp includes Tahiti 80 and The Appleseed Cast[W♥M] so you may probably hear more about One for the Team in the future. They didn't have quite the showmanship of the second band called Colourmusic (colourmusic.net), who were dressed in all white down to their instruments. I was pretty impressed with Colourmusic's style, which emphasised on drumming, bass, and acting like goofballs. The highlight of their set was when the rhythm guitarist took up a second drum. Overall, a pretty enjoyable show, despite a very tired me having been awake since 6am.